An employee of one of our Sheffield customers has given herself an eye-catching makeover to raise money for Cancer Research UK. Suzanne Wood, aged 56, works in warehouse and shipping for Poco Nido, a children’s footwear and clothing brand based at our Baltic Works business in Sheffield. She has lost several members of her family to cancer, including her father, Walter Butler, who died from lung cancer six years ago. 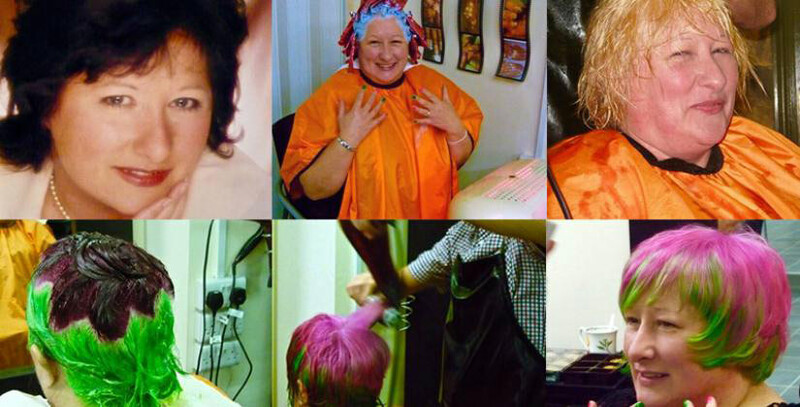 On 20th November, Suzanne dyed half her dark brown hair lime green and the other half pink to collect as much cash as she can for Cancer Research UK, in collaboration with Stand Up to Cancer. Then on Saturday 28th November – the day which would have been her father’s 86th birthday – she will be shaving it all off completely! Initially, Suzanne had hoped to raise £300 but she has already collected almost £800 and is hoping even more people will support her cause. Please support Suzanne’s fundraising efforts by visiting her Just Giving page. But she says other members of her family including her father and his sister Mary had not been so lucky. Suzanne used to work as a funeral director but after her father’s death she suffered a breakdown and couldn’t face returning to her profession. So she decided to reinvent herself and started working for Sheffield-based Poco Nido 18 months ago. The expanding company, founded by mother-of-two Catherine Lobley, provides 'Little People's Clothing & footwear' and moved into our Baltic Works centre in June this year. The centre’s site has an interesting history – part of the hit British movie The Full Monty was filmed there and the former Victorian steel and engineering works was hit by one of the first bombs in the First World War in September 1916. Dying and shaving her hair will be a big move for Suzanne, who has always been proud of her dark locks. The Baltic Works is home to a variety of businesses and has built up a real sense of community among the customers and staff. Built in 1850, it has a caretaker who lives on site and keeps the units secure. It features a selection of workshops, light industrial units and storage units in a range of sizes to suit the needs of customers. For more information about the centre, call Business Centre Manager Connor Johnson on 01909 281421.